Olympic National Park, the 5th most visited park in the United States, is amazingly still left off the list of many visitors to Washington State. Just a few hours from Seattle, Olympic National Park gives visitors a chance to explore glacier capped mountains, rain forests, and beaches, all within the park boundaries. Called three parks in one by nearly all who visit, a trip to Olympic National Park is a nature experience you'll never forget. While many know of Olympic National Park, few who haven’t visited the region understand what makes it such a sought after destination for hikers, adventurers, families and road trippers from around the world. So, here are 8 reasons to explore Olympic National Park. At 1,442 square miles in size, Olympic National Park is larger than Rhode Island by 200 square miles, over half the size of Delaware, nearly twice as large as Great Smoky Mountain National Park, and 300 square miles larger than Yosemite. One road surrounds the park and to drive around the entire park takes nearly six full hours with no stops. Olympic National Park is also home to 49 peaks over 6,500 feet, many of which are rarely climbed due to difficult terrain and isolation. Over 600 miles of trails are waiting to be explored and enjoyed, the majority of which are designated wilderness by the National Park Service. 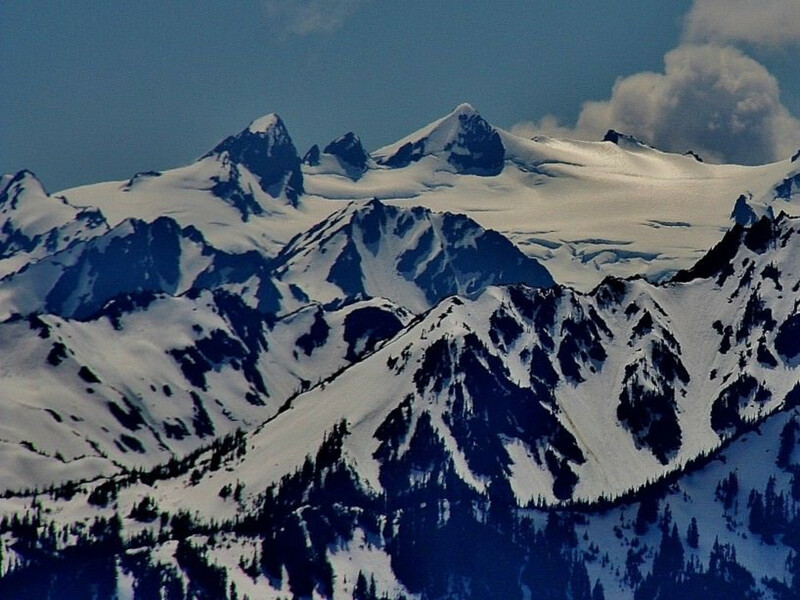 Olympic National Park is home to 266 glaciers spread throughout the park. Blue Glacier, located on Mount Olympus, is 2.6 miles long and is estimated to be the size of 20 trillion ice cubes. There is a common misconception about the Olympic National Park. While the region is known for amazing rain forests, incredible mountain peaks, gorgeous beaches and salmon stocked rivers, few people actually come to visit the park for its wide range of animals. Usually, if people want to see wild animals they travel to Yellowstone National Park. 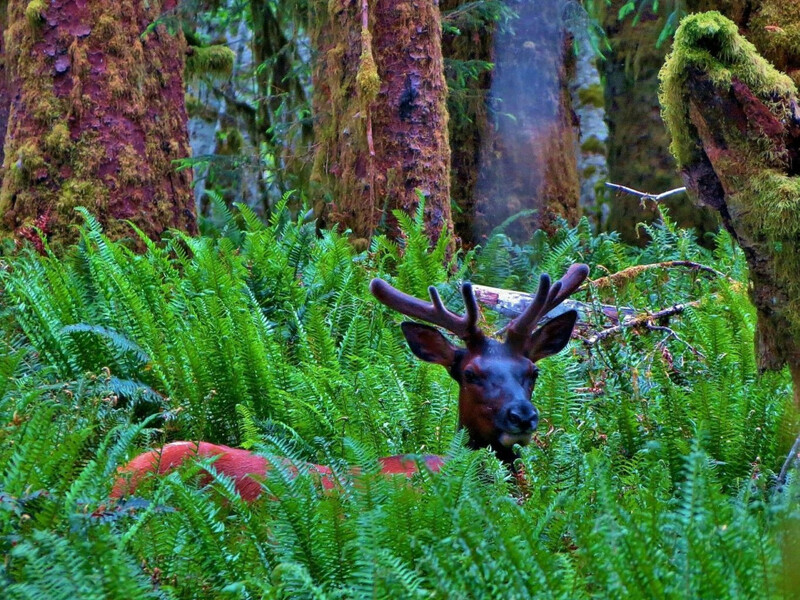 However, before you make that trek, check out the amazingly abundant wildlife right here on the Olympic Peninsula. From the Roosevelt elk, which are the bases for the founding of the Olympic National Park, to the marmots, slugs, flying squirrels and salamanders that are endemic to the Olympic Peninsula, the region is alive with hundreds of different animals. The beaches of Olympic National Park are some of the best in the world, but not for those who like to lay on pristine sections of coast with warm waters. Olympic’s beaches are rocky, craggy, full of sea life, and provide amazing hiking opportunities. Complete with some of the most picturesque sea-stacks in the world, these beaches make for great storm watching on rainy days and amazing hiking on sunny days. Depending on the season, whales, both gray and Orca, are visible from every beach. 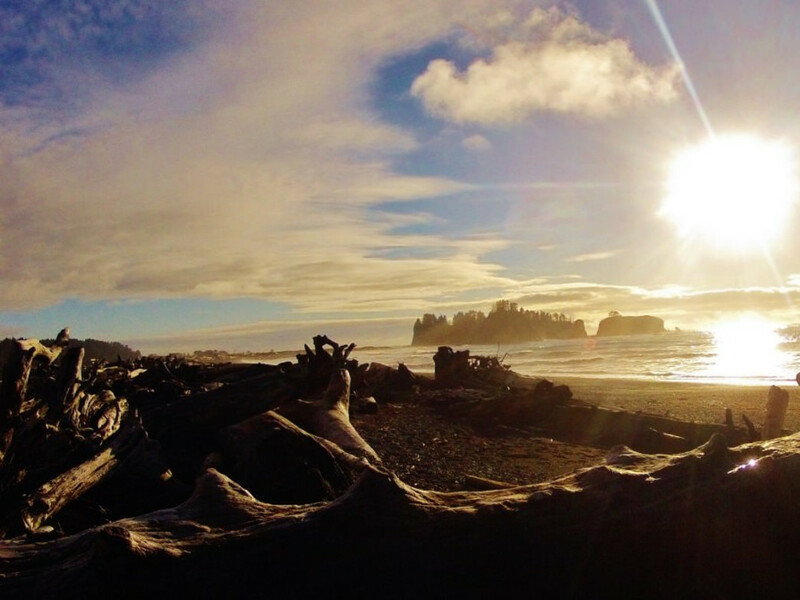 From LaPush to Shi Shi and the popular Ruby Beach, each and every visitor that sets their sights on the Washington Coast will fall in love with it. Whether you are looking for a day hike, a backpacking trip, or an amazing place to catch the sunrise, few places compare to the Pacific Coast of Olympic National Park. 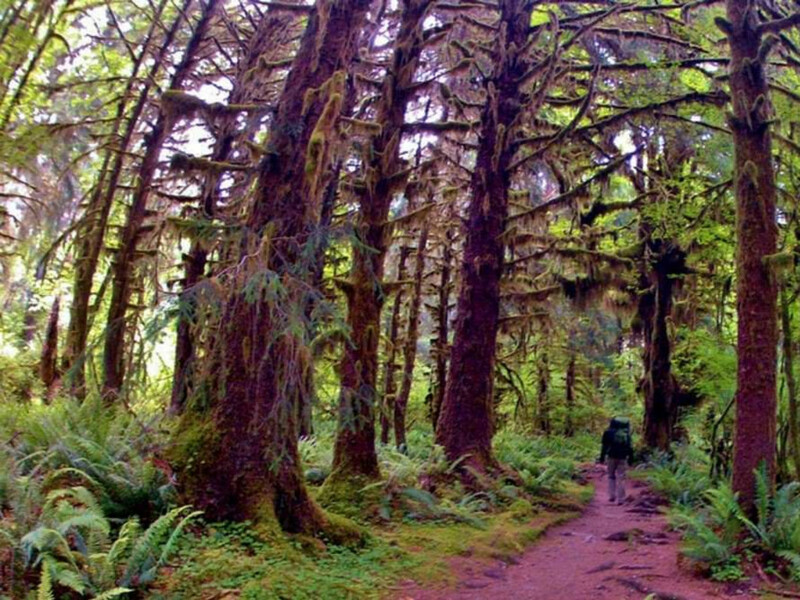 Technically, the western edge of Olympic National Park is one rainforest, but locals have broken these rainy, temperate forests into three distinct rainforests; the Hoh, Queets, and Quinault. The Hoh Rainforest is the most famous, with moss-covered trees, short and flat hiking trails, and over 120 inches of rain falling annually. 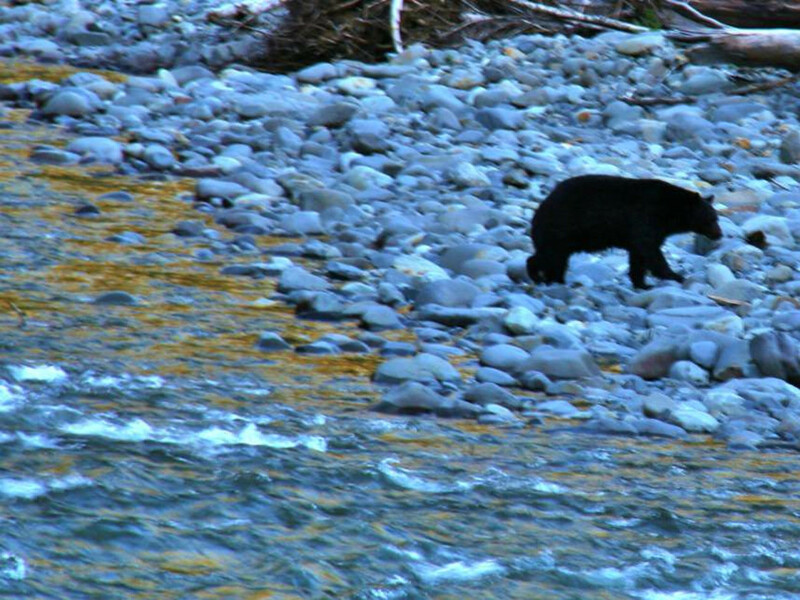 Bobcat, bear and elk can be seen along creeks, gorging themselves on salmon who've returned to their spawning grounds upstream. For the more adventurous, the Hoh Rainforest is where you can summit the tallest peak in the park, Mount Olympus. 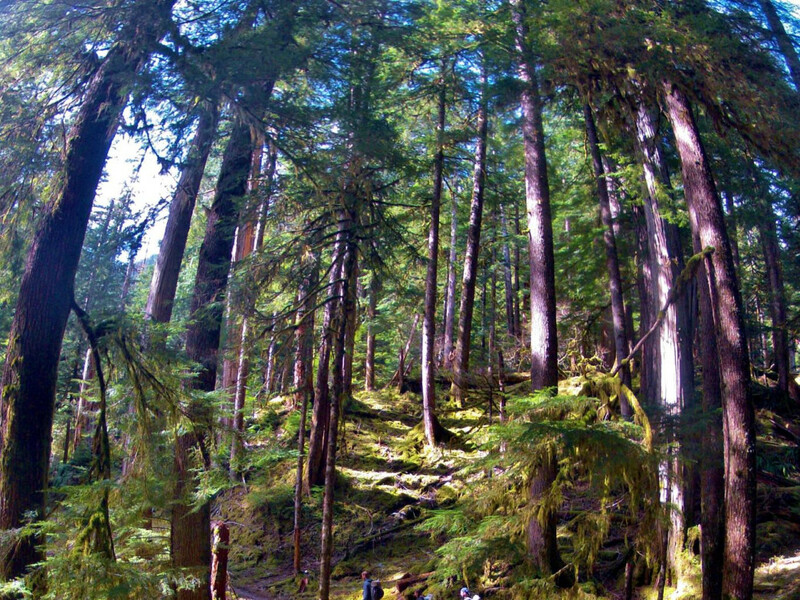 The Queets rainforest is the most remote and less visited rainforest region in Olympic National Park. With up to 140 inches of rain, the Queets Rainforest is where every drop of rain falls before the clouds off the Pacific Ocean rise of the mighty Mount Olympus. If you want to be alone in a rainforest, this is where you must go. 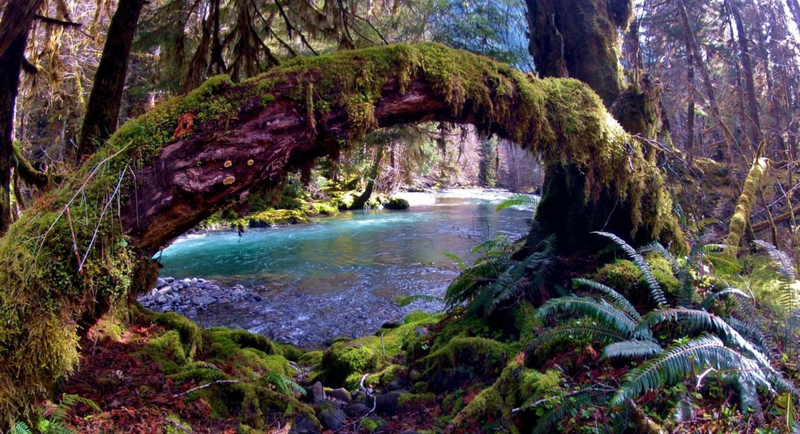 The Quinault Rainforest is one of the classic destinations for tourists looking to get away from the more popular Hoh Rainforest region. 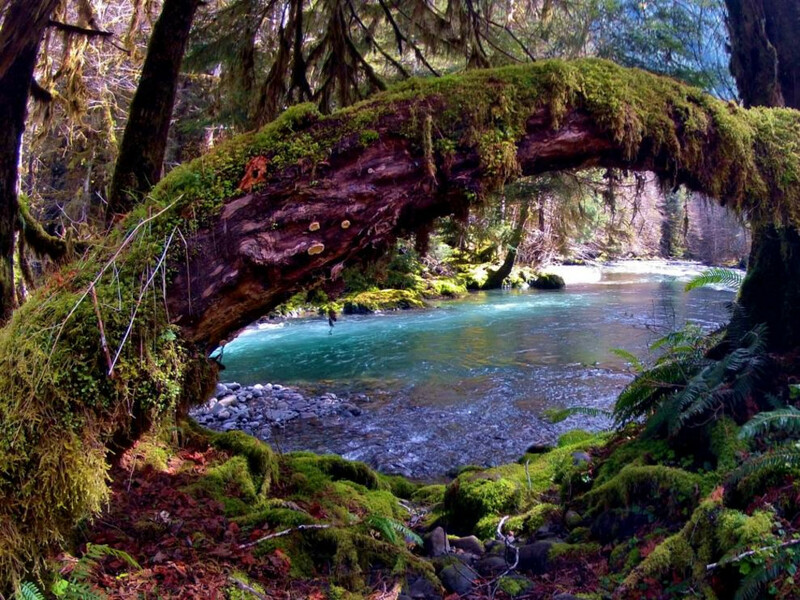 With 120 inches of a rain a year, this wet, damp, moss-covered forest is home to black bears, salmon, eagles, waterfalls and incredible backpacking trips, exploring the Quinault Rainforest should be at the top of everyone’s list. Olympic National Park consists of water, so the rivers, lakes and waterfalls of the region serve as the life-force. High alpine lakes, like Lake of the Angels and the Seven Lakes Basin region are sought after hiking and backpacking destinations. If isolated lakes aren’t what you enjoy, Lake Crescent and Lake Quinault are fantastic lakes in the park. Lake Crescent, near to great hiking, kayaking and camping is the second deepest lake in Washington State, estimated to be over 1,000 feet deep in places. Lake Quinault isn’t nearly that deep, but it is home to great views, a classic old lodge, and it's close to the mountains, the rainforest and the ocean. The most famous rivers of the region are the Hoh, the Elwha, the Quinault and the Queets, but many smaller rivers also support life. With a healthy salmon population, the rivers are popular with anglers of all abilities, but fishing in the park is not allowed. The rivers in the park are wild, carving canyons through rugged terrain and creating breathtaking and remote waterfalls. Service Falls, along the Queets River, has yet to be explored on foot, thanks in part to a prohibitive 200 hundred foot canyon. The waterfalls of Olympic National Park are hands-down, some of the most beautiful waterfalls you will see. With over 100 inches of rain falling throughout the majority of the park, water seems to be flowing from everywhere, cascading down every nook and cranny. 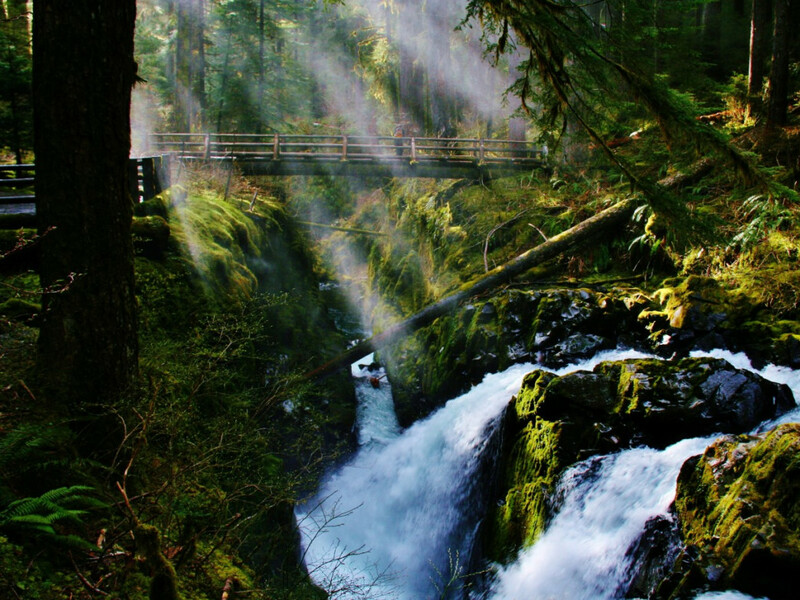 From the iconic three tiered waterfall of Sol Duc to the beautiful roadside falls of the Quinault and everything in between, if you love waterfalls, you will love the Olympics. It is hard to imagine hiking anywhere more beautiful than Olympic National Park, and once you step foot on the over 600 miles of trails, you will get hooked. 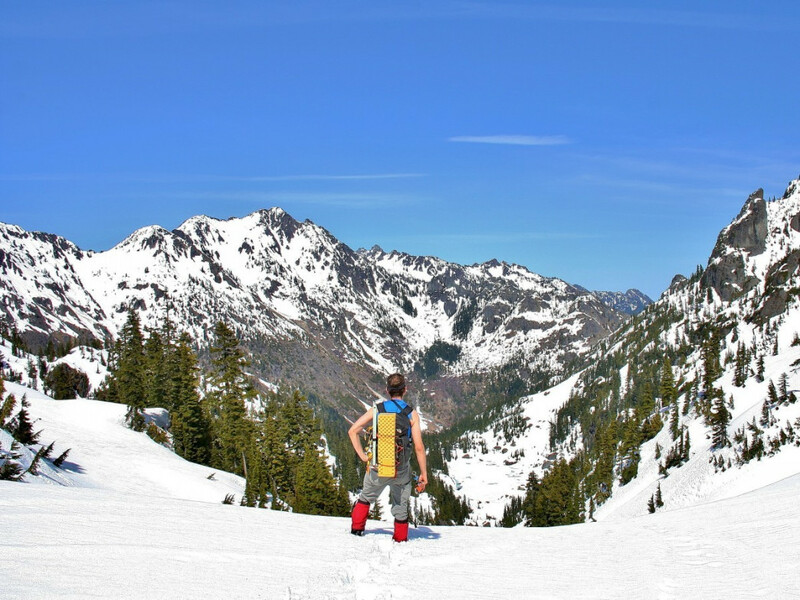 From low land hikes along gorgeous beaches and dense rainforests to summiting isolated peaks or walking along treeless ridges that allow you to see to the ends of the earth, the views and experience one gets from hiking the Olympics are arguably some of the best in the nation. Other parks may have good beach trails, or great hikes along rivers or lakes, but Olympic has it all. Olympic National Park is one of the most isolated places in America, home to the 'Quietest Square Inch in the States'. While some trails can get crowded by local standards, visitors who have experienced the masses at Yosemite, Yellowstone or the rim of the Grand Canyon will feel isolated and far removed from society. With Seattle being hours away, few take the time to hit the trails in Olympic. Aside from a few summer days, only the heartiest of visitors will venture further than a half mile down the trails of the region, letting you have the majority of the park to yourself year round.